One advantage of Orlando is that it’s a good base to use to explore more of southern Florida. If you have a car and you don’t mind a few days away from the theme parks, there are some fantastic sights to see. 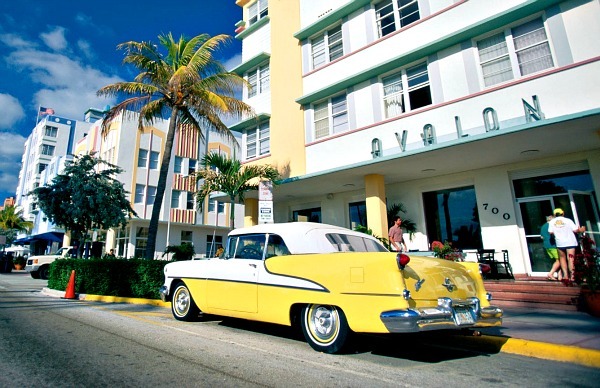 Miami is about 4 hours drive, but it was Miami Beach we liked best with its art-deco buildings and endless sand. Top of the list for must-see sights though are the Florida Keys, the series of islands at the bottom of Florida’s mainland. Starting at Key Largo, a series of the most impressive road bridges you’ve ever seen link each of the keys down to Key West. 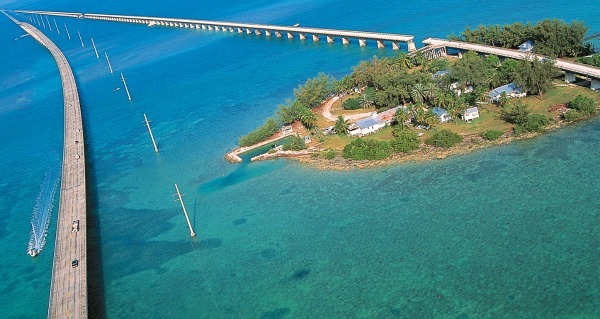 They’re known as the Overseas Highway and the biggest of the bridges is 7 mile bridge from Knight Key to Little Duck Key. The current bridge was built in the late 1970s and alongside it, sits some of the now-disused much older bridge. It’s been used in countless movies over the years. All the keys have their own feel and some are bigger than others and have more development. Key West is definitely the star though and has a real Cuban feel to it. You can walk round most of the central bit of the island easily and don’t forget to call in at Ernest Hemingway’s house too. One of the biggest activities in Key West is watching the sun go down from the beach. There’s often a real party atmosphere as people gather to watch the sunset and there are traders nearby selling keep-sakes and food. 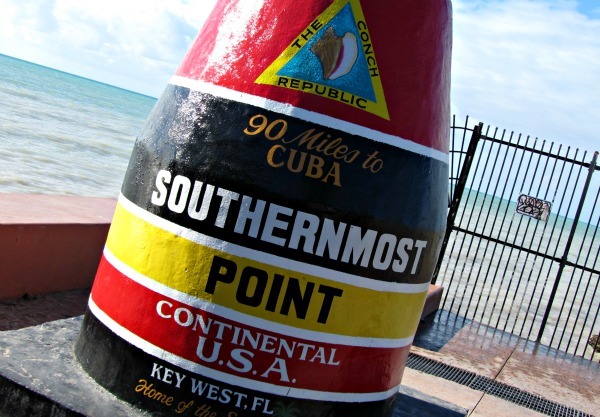 One of the biggest daytime activities is joining the line to take a photo of the marker below – it’s the most southernmost point of the USA. Everywhere you go in the Florida Keys, you’ll find the local delicacy Key Lime Pie on the menu. Make sure you sample some on your trip. 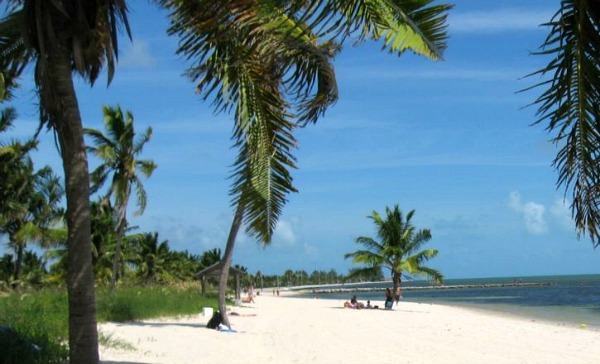 One other thing to bear in mind if you want to visit Key West is that it is sometimes dominated by groups of people with a common interest who headed there for a few days. For example, when we visited, the whole place was full of bikers and whilst that added to the atmosphere, accommodation was hard to come by! Other places in Florida we’d recommend visiting are Naples, where the beach and is just perfect and St Petersburg Beach with a real vacation feel. This map shows Key West, but you can move it around to see other bits of southern Florida. Key West is the southernmost point of the USA and the end of line of islands known as the Florida Keys.